Before you apply for a firefighting engineer job you need to read a lot about firefighting systems types and design. We know that the field of firefighting is huge and you can not be familiar with all systems, and if you applying for a site engineer job you need more experience. 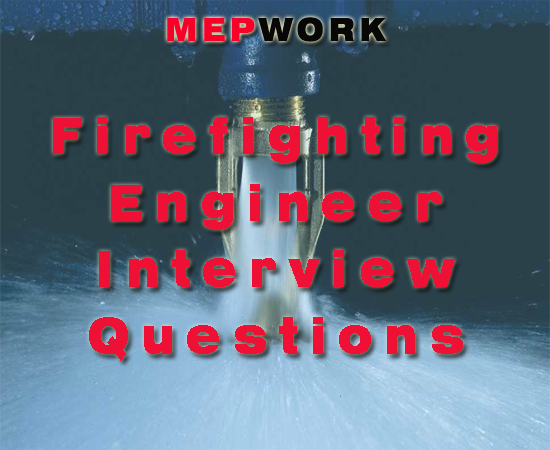 If you are a fresh graduate or you shifted your career, you need to know the most common questions that come in interview for firefighting engineers. The answer for these questions are important than these questions. The interviewer concentrates on the questions that measure the ability to continue in this job not only the technical questions. I recommend these 50 interview questions with their answers for you, read them carefully with their answers. The interviewer will not ask questions out of them. Do Not Promote Your Business or Your Website Here. Spam Comments Will Be Deleted.